It frequently happens that “integers” for test-taker are associated only with positive whole numbers, but actually they also include positive and negative numbers as well as 0. On the GRE there are a lot of problems involving integers and you should be familiar with their properties, since most of these problems are underrated by test-takers and have many hidden pitfalls. Note that a variable (such as x) can have either a positive or a negative value, unless there is evidence otherwise. Note: On GRE the variable x is not necessarily positive, nor is –x necessarily negative. 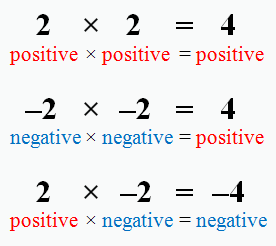 By now you probably know how to add or subtract positive/negative numbers, so as a reminder subtracting negative from positive: 3 – (–2) = 3 + 2 = 5. This is very easy to miss, especially if you work with parentheses: 7 – (12 – 9) = 7 – 12 + 9 = 4. This principle can be extended to multiplication and division by more than two numbers. For example, if 3 numbers are multiplied together, the result will be positive if there are NO negative numbers, or TWO negative numbers. The result will be negative if there is ONE or THREE negative numbers. We can summarize this pattern as follows. When you multiply or divide a group of nonzero numbers, the result will be positive if you have an EVEN number of negative numbers. The result will be negative if you have an ODD number of negative numbers. The absolute value of a number answers this question: How far away is the number from 0 on the number line? For example, the number 5 is exactly 5 units away from 0, so the absolute value of 5 equals 5. Mathematically, we write this using the symbol for absolute value: |5| = 5. To find the absolute value of –5, –5 is also exactly 5 units away from 0. Thus, the absolute value of –5 equals 5, or, in mathematical symbols, |–5| = 5. Notice that absolute value is always positive, because it disregards the direction (positive or negative) from which the number approaches 0 on the number line. Note: |0| = 0 is the smallest possible absolute value. Even numbers are integers that are divisible by 2. Odd numbers are integers that are not divisible by 2. All integers are either even or odd. Note: 0 is even! Negative integers are also either even or odd. The GRE tests your knowledge of how odd and even numbers combine through addition, subtraction, multiplication, and division. Rules for adding, subtracting, multiplying and dividing odd and even numbers can be derived by simply picking numbers and testing them out. While this is certainly a valid strategy, it also pays to memorize the following rules for operating with odds and evens, as they are extremely useful for certain GRE math questions. Note: Same rules for subtraction and division respectively. Parentheses: first do whatever appears in parentheses, following PEMDAS within the parentheses if necessary. Exponents: next evaluate all terms with exponents. Multiplication and Division: then do all multiplications and divisions in order from left to right. Addition and Subtraction: finally, do all additions and subtractions in order from left to right.